Wednesday, March 27, 2019 - A video has emerged showing fake prophet David Owuor of Repentance and Holiness Ministries being worshipped by his brainwashed followers like a god. Owuor was recently exposed badly by a family that cried for justice after he brainwashed their daughter who was a judge and forced her to resign from her lucrative job and become a full time minister in his church. He went ahead and convinced her to transfer her properties that included lavish apartments in the leafy suburbs of Nairobi to him. 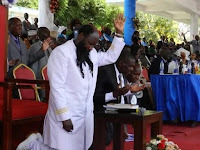 In the video, Owuor’s followers are seen playing violins to him and then bowing down the way angels bow down before God.